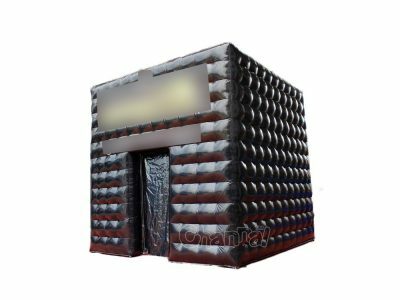 Inflatable photo booth is a blow up cube tent with LED lights and camera system for taking group photos and selfies at any indoor and outdoor events. The lights of blow up photo booth are installed at the bottom, their colors are changeable so as to match your occasions and themes. Inflatable photo booth enclosure and wall are perfectly fit into many events, such as weddings, birthday parties, Christmas holidays, concerts, proms, corporate events, etc. You can decorate the photobooth with funny props, like funky sunglasses, frames, hats, mustache, etc. Channal Inflatables is a professional inflatable photo booths manufacturer and supplier in China. Contact us now to get your cheap inflatable booth manufactured and delivered early before your upcoming events.